DATE AND PLACE OF BIRTH: May 6th, 1966, the town of Schelkovo, Moscow Region, RSFSR (Russia). His farther is Aleksandr Aleksandrovich Skvortsov, born in 1942, former student - cosmonaut of AF CTC, enrollment in 1965. His mother is Nina Ivanovna Skvortsova (Zabelina), born in 1938, the Head of kindergarten. EDUCATION: In 1983 he finished secondary school No 2 in the town of Morshansk, Tambov Region. In 1987 he graduated from Stavropol Miitary Aviation School of pilots and navigators after Air Force Marshal V.A. Sudets acquiring a speciality "Command-Tactical Fighter Defense Aviation". In 1997 he graduated from Aviation Faculty of the AAD Military Academy after G.K. Zhukov in Tver acquiring a speciality "Navigation, Operational-Tactical Fighter Defense Aviation". His wife is Yelena Grigorievna Skvortsova (Krasnikova), born in 1966, mechanical engineer. His daughter is Anna Aleksandrovna Skvortsova, born in 1990. He was awarded the medals: "70th Anniversary of the USSR Armed Forces", "Distinguished Military Service" First Class and Second Class; "Irreproachable Service" third Class. HOBBY: Scuba-diving, football, hunting, fishing, hiking. From November 17, 1987 he served as a pilot, from November 14, 1989 he served as a senior pilot and from August 4, 1993 he was appointed the Commander of Aviation Flight of 191st fighter air regiment, 7th AAD Corps, in the town of Yefremov, Tula Region. He mastered aircraft L-39, MiG-23UB, MiG-23M, MiG-23P. Total flying time is about 950 hours. On June 20, 1997 (prior to State Interdepartmental Commission, on graduating from the Academy) by the RF Ministry of Defense Order he was enlisted as test-cosmonaut in the Cosmonauts Corps of CTC RGNII. On July 28, 1997 the State Interdepartmental Commission resolved that the should be recommended to be enrolled in the Cosmonauts Corps of CTC RGNII. From January 16, 1998 till November 26, 1999 he had received general space training (GST). On December 1st, 1999 the State Interdepartmental Commission resolved that he should be given test-cosmonaut qualification. From January 5, 2000 he got training under the ISS Mission Program as part of Cosmonauts Team. In July 2004 he took part in survival trainings under extreme conditions at Baikonur cosmodrome. In January 25-27, 2007 he took part in survival trainings in the forest near Moscow as the Commander of provisional crew together with Malaysian cosmonauts Sheikh Muzafar and Faiz ben Haled. I n August 2007 he was preliminarily assigned to backup crew of the ISS expedition 21. In July 2008 it was reported that he had been assigned to Prime crew of ISS Expedition 24. On September 21, 2008 that assignment was confirmed in the ISS Mission Plan released by Roscosmos press service. On November 21, 2008 his assignment was officially confirmed by NASA in announcement of ISS-10-26 crew complements. In April 2009 information was released that he had been assigned to prime crew of ISS Expedition 23. 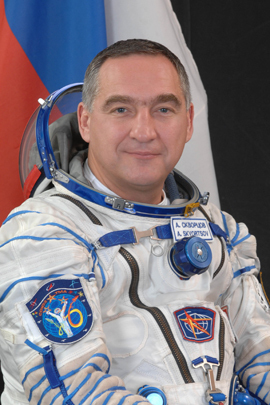 In August 2007 he was preliminarily assigned to backup crew of the ISS expedition 21. 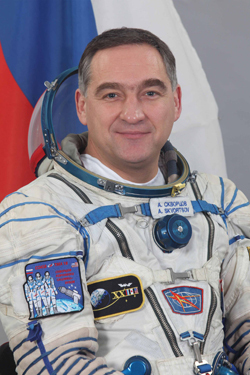 In July 2008 it was reported that he had been assigned to Prime crew of ISS Expedition 24. On September 21, 2008 that assignment was confirmed in the ISS Mission Plan released by Roscosmos press service. On November 21, 2008 his assignment was officially confirmed by NASA in announcement of ISS-10-26 crew complements. In April 2009 information was released that he had been assigned to prime crew of ISS Expedition 23.